Compassion is the one thing I want to spread in the world. I believe it’s a necessity that often gets overlooked. As an English and Art teacher of pregnant and parenting teens, many of whom come from difficult situations, I know they need to be treated with compassion. 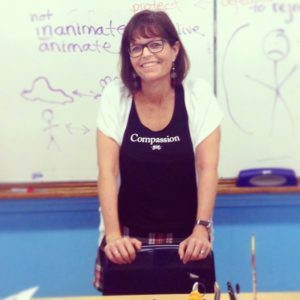 When I got my Compassion t-shirt, I thought it would be a great opportunity to have a lesson about the power of words. We’ve done this twice so far. Remember, these are pregnant and parenting teens. The second time, I used the company in a different way. We examined the website first. We analyzed the way it was put together, how the store worked, who might be the “buyers” of these shirts, and various other marketing aspects of the site. The students then created their own t-shirt company; complete with logo, message, and where they would sell the t-shirts. They chose the name of their company and a logo (a heart surrounding the word, “myself”). 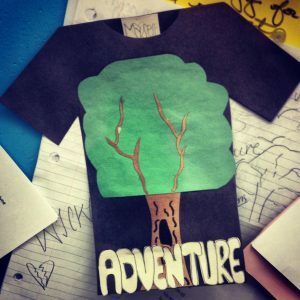 They designed a shirt with the word “ADVENTURE” with a big oak tree behind it. They created a store coupon and decided their tees would be sold exclusively “on-line.” It was a great lesson in marketing, business creation and again, a wonderful lesson on the tremendous power of words. Since then, we have continued to discuss the power of words and the impact they have on those around us. Using Positivity Designs has been a great resource for my classroom, and I love my tank top even more!